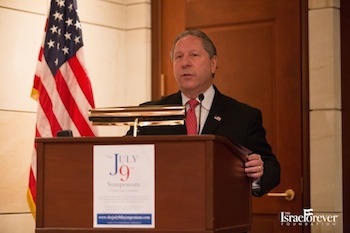 As Hamas Rockets began falling in Israel, a panel of distinguished speakers and guests convened at The US Capitol on Wednesday July 9, 2014 for The July 9th Symposium, which was held exactly ten years after the issuance of the unjust International Court of Justice Advisory Opinion on Israel’s Terrorism Prevention Security Fence. Speakers included Ambassador Ron Dermer – Israel’s Ambassador to the United States, Ambassador Keith Harper – US Ambassador to the United Nations Human Rights Council, Prof. Irwin Cotler – Former Minister of Justice and Attorney General of Canada,Frederick M. Lawrence – President, Brandeis University, William C. Daroff – Senior Vice President, Jewish Federations of North America, Kenneth L. Marcus – President and General Counsel, Louis D. Brandeis Center, Sarah Stern – President, EMET, and David Michaels – Director, B’nai B’rith International Office of UN Affairs. 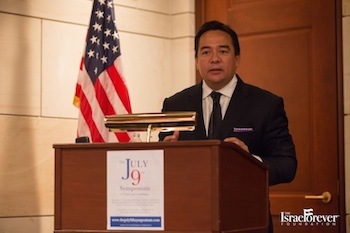 The July 9th Symposium was organized and moderated by Israel Forever Foundation’s Founding Chair, Richard D. Heideman, Senior Counsel of Heideman Nudelman & Kalik, PC, which represents victims of terrorism and others whose human rights have been violated. 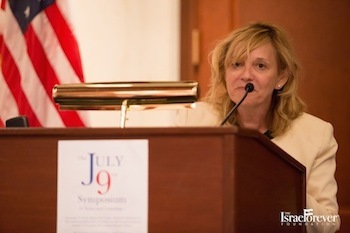 Heideman is the author of The Hague Odyssey: Israel’s Struggle for Security on the Front Lines of Terrorism and Her Battle for Justice at the United Nations. 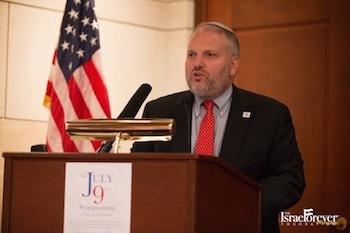 The Symposium provided insight and information on Israel’s battle for justice at the United Nations, her stand against terrorism and her commitment to protecting her people. 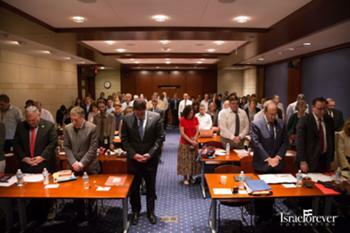 The event was co-sponsored by The Jewish Federations of North America, B’nai B’rith International Office of UN Affairs,The Lawfare Project, Heideman Nudelman & Kalik, PC, The Louis D. Brandeis Center for Human Rights Under Law,Endowment for Middle East Truth, The Israel Forever Foundation, The Institute for Law and Policy of The Hebrew University Faculty of Law, American Association of Jewish Lawyers and Jurists, The Jewish Community Relations Council of Greater Washington, and The Jewish Policy Center. 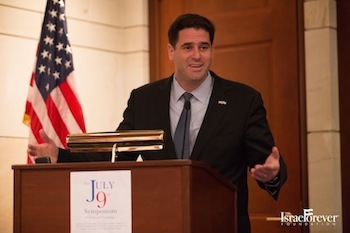 Ambassador Ron Dermer, Israel’s Ambassador to the United States and former top advisor to Israeli Prime Minister Benjamin Netanyahu, delivered the Keynote Remarks, stating that the millions of Israelis taking shelter in safe rooms in Israel was the equivalent of over 200 million people seeking refuge in bomb shelters in the United States. He pointed out that bombs over Tel Aviv and Jerusalem, Israel’s major cities, is like bombs over New York and Washington. Moreover, neither the United States nor any other country in the world would tolerate such attacks upon its sovereignty and its people. 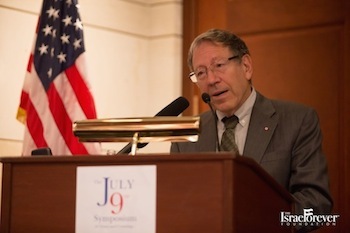 Frederick M. Lawrence, President of Brandeis University, in addressing the Symposium, pointed out the comparative distinctions between the dissenting opinion of Hon Thomas Buergenthal, former Judge at the International Court of Justice and that of Justice Aharon Barak of Israel’s Supreme Court, further highlighting Israel’s respect for the rule of law and commitment to the due process rights of those aggrieved by the construction of the security fence. Indeed, Israel’s High Court rendered an opinion mandating relocation of the security fence, and did so prior to the Advisory Opinion of the International Court of Justice, which totally ignored the decision of Israel’s highest court. 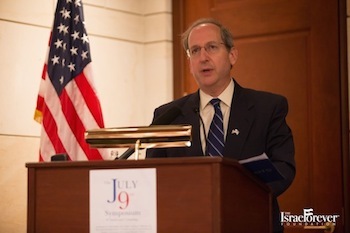 President Lawrence further addressed the issues of freedom of speech on college campuses in the context of growing anti-Semitism and anti-Israel attitudes on the college campuses. 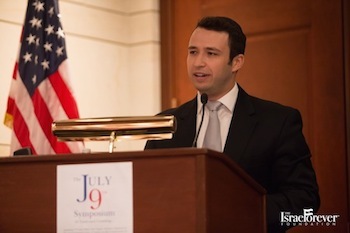 William C. Daroff, Senior Vice President of Jewish Federations of North America and head of the JFNA Washington public policy office, addressed the assault on Israel’s legitimacy in activities and actions ranging from boycotts, divestment and sanctions to increasing attacks upon Israel’s standing, particularly when viewed in the multi-decades long assaults upon Israel not only at the United Nations but in the court of public opinion. 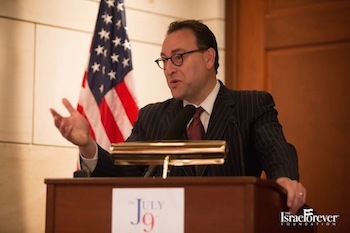 David J. Michaels, Director of United Nations Affairs for B’nai B’rith International, explained the long-standing adverse attitude faced by Israel at the United Nations since its establishment as a nation-state. Michaels recounted the various resolutions adopted year after year against Israel in the halls of the UN while also holding out some hope that Israel might indeed find itself more welcomed in the halls of the UN now that it has been accepted into the Western European and Others Grouping at the UN.